Emigration Canyon is a great place to ride. One of the best in Utah, and in my opinion, certainly the best in Salt Lake County. For nearly 8 miles, the road winds and rolls uphill till it crests Little Mountain Summit. For most of that, it parallels Emigration Creek which tumbles and spills through the woods as it runs downward to the valley. The pitch of the road ranges from nearly flat to gentle to more challenging. It is enough to test your fitness, but never so difficult as to be daunting to a rider with average fitness. At the summit, you are rewarded with a panoramic view of the canyon, Mountain Dell Reservoir and surrounding mountains. For those wanting to spend more hours and miles in the saddle, Emigration Canyon is the opening leg for a number of different options. You can head down to Parley’s Canyon and loop back down into the valley, or head up Parley’s Canyon to Parley’s Summit and on to Park City and destinations beyond. Alternatively, you can ride to the top of Big Mountain, down to East Canyon Resort and on to Morgan. Anywhere along the route, you can turn around and head back. One year, my friend David Bern and I continued on to Trapper’s Loop and up to Snow Basin ski resort before turning around and retracing our steps to home, a ride of almost 115 miles. Or from Little Mountain Summit you can simply turn around and enjoy a nice descent back down the canyon. Whatever one chooses, Emigration Canyon is a great place to start one’s ride. It is also a great place to live. I have the good fortune to be one of its residents. Emigration Canyon (or simply “the Canyon” to those of us who live here) is a refreshing retreat in which to find home and hearth. These is nothing quite like a cool, calm and refreshing evening on one’s deck or patio to soothe the soul after a day in the hurried and harried valley. But change is afoot in this idyllic locale. For the very reasons I have outlined above, and due to a growing population generally, conflicts have arisen in the Canyon. While frustrations between motorists and cyclists have been the most noticeable, they have also spilled over to runners, motorcyclists and others. This last year, these conflicts and ensuing efforts to deal with them resulted in the creation of the Emigration Canyon Roadway Improvement Committee (ECRIC) charged with the responsibility of studying these issues and making recommendations to Salt Lake County. This Committee spent much of last year in this effort. The result was a comprehensive report and list of recommendations to Salt Lake County. In conjunction with this, Salt Lake County retained a consulting engineering firm, HW Lochner, to come up with specific proposals to address traffic issues in Emigration Canyon. As part of its project, Lochner has set about to obtain input on traffic problems in the Canyon. To that end, a website has been established, www.emigrationstudy.com, where the public can provide input on identifying issues in Emigration Canyon. On that site, you can also sign up to receive email updates on this project. An open house was held in Emigration Canyon on March 25th where the input gathered so far was displayed and those attending were able to provide more input. The period for providing input is nearly over, so those interested should visit this website and provide their input within the next couple of weeks. During the next few months, Lochner will take this input and build upon the study done by ECRIC, and will make recommendations for transportation improvements and solutions to safety and roadway concerns. A public meeting will be held thereon in September. Cyclists need to be involved in this process. You can be guaranteed that Canyon residents, and the Emigration Canyon Community Council, will be very involved and influential. And while their concerns and desires are legitimate and sincere, they are generally not going to take into account the concerns and desires of cyclists. So as cyclists we need to be involved, provide our input and make certain our voices are heard. ECRIC heard and listened to voices from all concerned, conducted a thorough study and issued a fair and balanced report and recommendations. 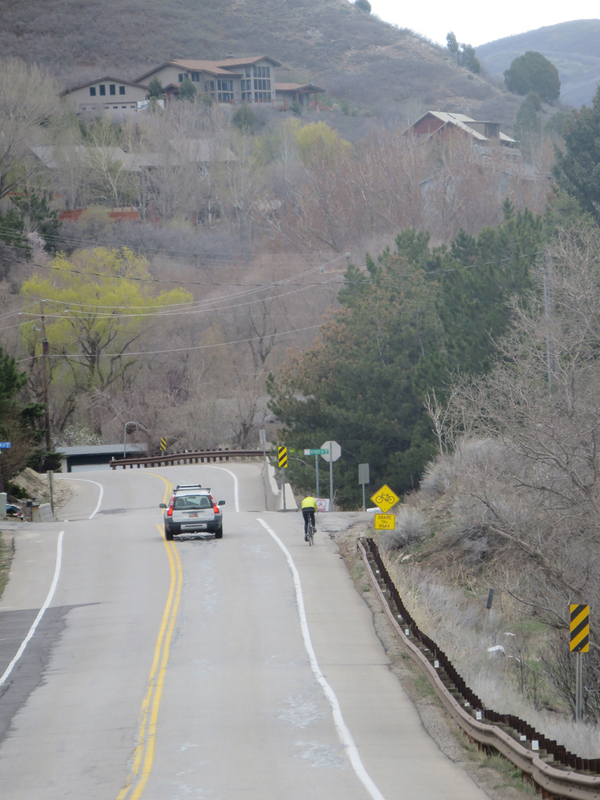 But unless cyclists stay involved, and continue to be heard, we may find that, in the end, the recommendations from Lochner and the resulting work to be done in Emigration Canyon do not favor cyclists, but rather diminishes the Canyon as a cycling Mecca. This will not be because Lochner and Salt Lake County ignored cyclists’ desires and concerns, but because we failed to stay the course and influence the process when it most mattered. I love Emigration Canyon. I love living here, and I love riding here. I know many of the people of who live here, and am well aware of their frustrations. I want a solution that addresses their concerns. But I also want a solution that preserves the Canyon as a premier cycling venue. I think both can and will be accommodated so long as we, as cyclists, continue to make our’s an integral voice that is heard and reflected in the recommendations and decisions that are made.